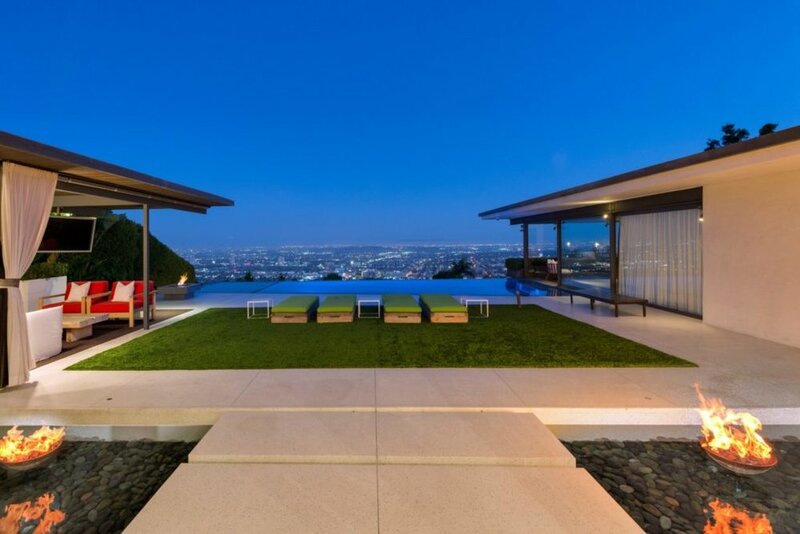 Could the views from this mid-century modern BE any more awesome? Chandler Bing would surely be jealous — and while there’s no Central Perk nearby, the Sunset Strip location is unbeatable for staying in the heart of the action. The sprawling 10,628-square-foot main house feels even bigger than its stated square footage thanks to an open floor plan and glass walls. 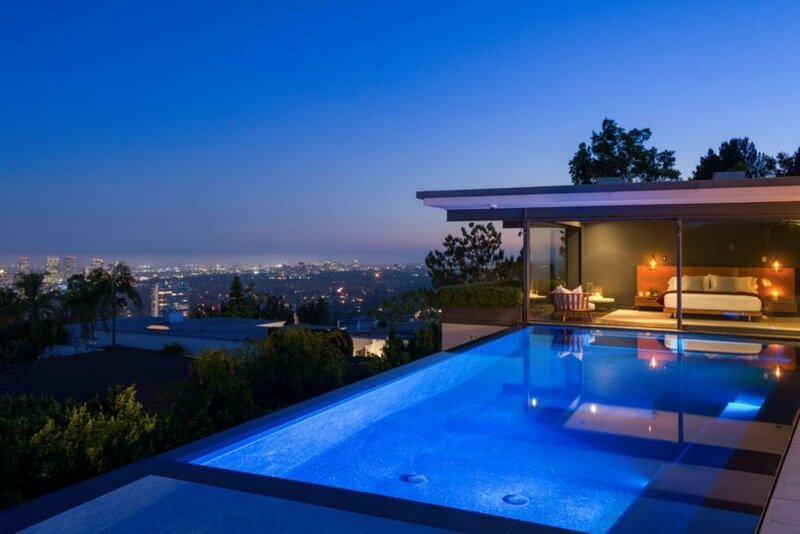 Jaw-dropping views of Los Angeles can be found from every angle of the hilltop perched 3-bed, 5-bath home. While the home doesn’t boast enough rooms for a large family, it does offer a screening room designed for a luxe movie-watching experience — complete with a view into the swimming pool. Whether used for hosting a summer pool party or Thanksgiving dinner with all your friends, the house is designed for flawless indoor and outdoor entertaining. Retractable glass walls in the living room open directly onto a backyard patio so guests can flow in and out without hassle. 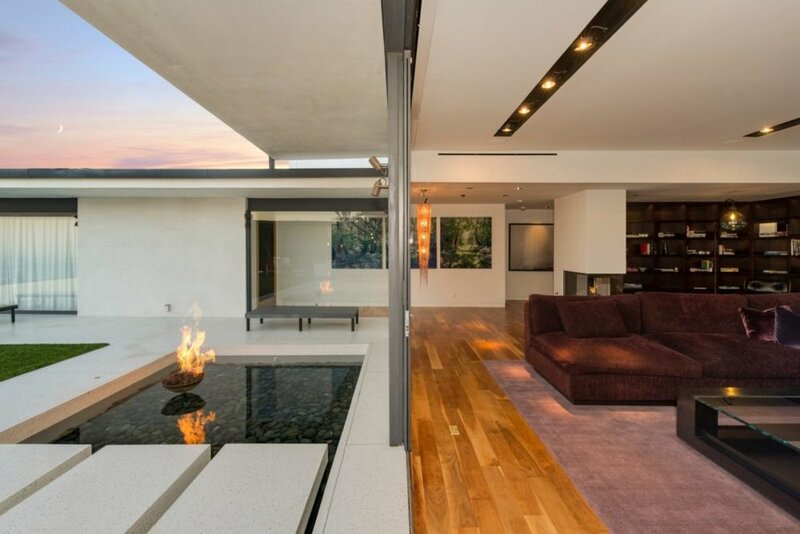 On either side of the patio walkway, dramatic self-enclosed fire pits float in mini pools filled with stones and water. Beyond that, three separate seating areas beckon — one directly in front of the infinity pool and two under a covered canopy. And in case you want to take a nap in the master suite after a dip in the pool, you can swim all the way up to the retractable bedroom walls. This home will set you back $13.5-million, but it’s an entertainer’s dream. Greg Holcomb and Cassandra Petersen of Partners Trust hold the listing. via Zillow Celebrity Real Estate and Front Porch Realty.